The affordable convertible. 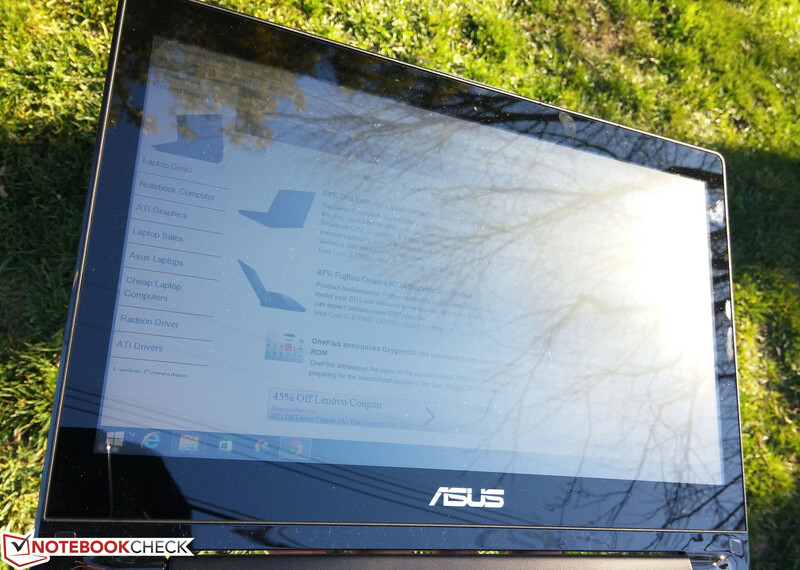 For about $500, this Asus is both a decent tablet and notebook. Unfortunately, a lot of important corners had to be cut to bring this transformer to such an inexpensive level. 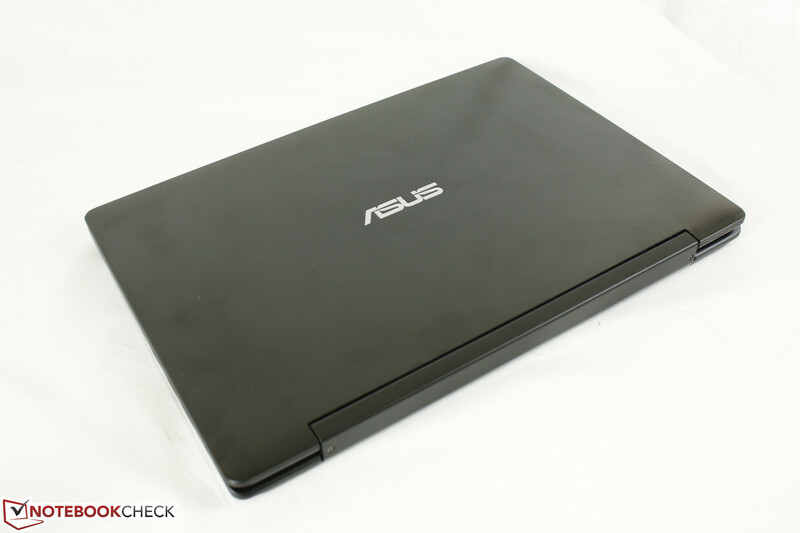 Asus is more than just Zenbooks and Transformers despite its concentrated marketing on the high-end lineup. The manufacturer offers plenty of options on the other side of the spectrum for those who would rather not drop a grand for the latest in mobile hardware. The Q302 is a more down-to-earth budget model with 360-degree hinges to better appeal to those looking for a multi-purpose solution. 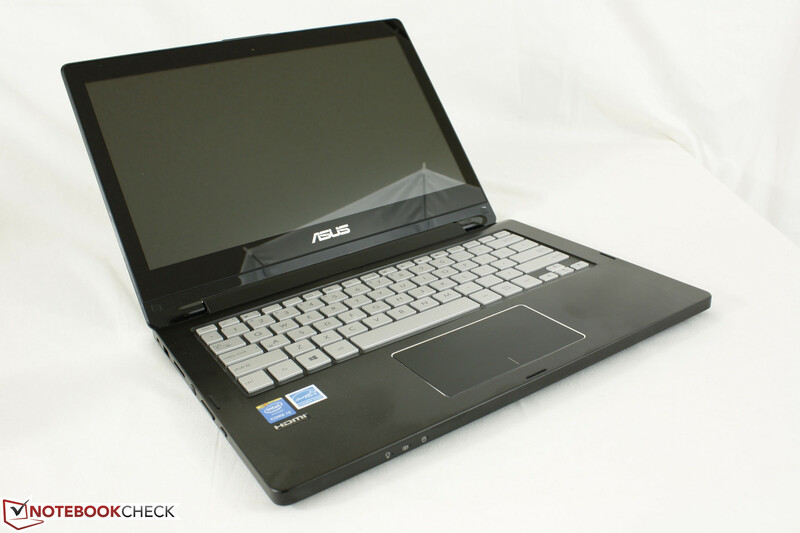 For around $500, our 13.3-inch test model comes equipped with a Core i3-4030U, 2 GB RAM, 1366 x 768 display, and a 500 GB HDD. We put the model through our quick set of tests in this short review to see if budget-conscious buyers should consider this alternative convertible. Aesthetically, the Asus Q302 has a sleek and flat profile that already puts it above other budget notebooks in this price range. 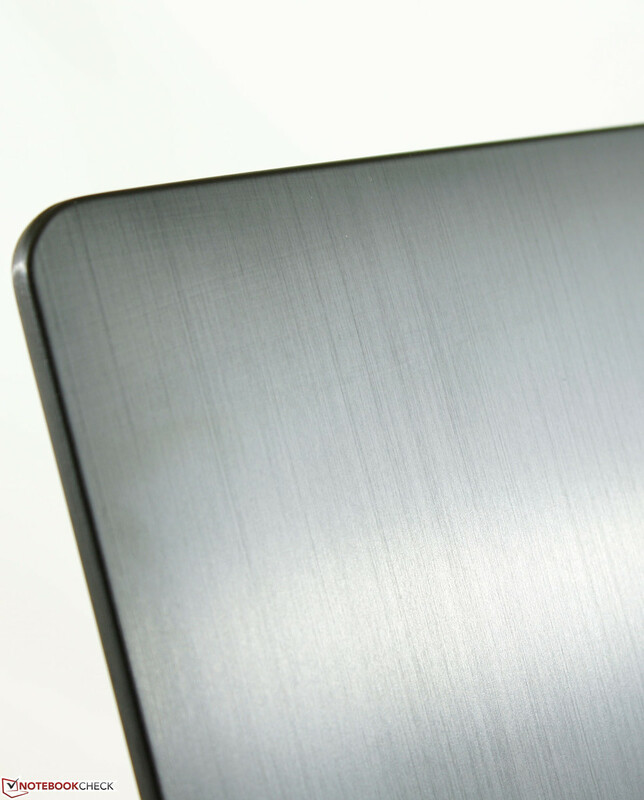 The brushed aluminum outer lid and base make the notebook look more expensive than it really is while the matte plastic bottom has a rougher texture in contrast to the smooth surfaces on the Lenovo Edge series and Dell XPS 13. Build quality is good considering the price with rigid hinges and base. 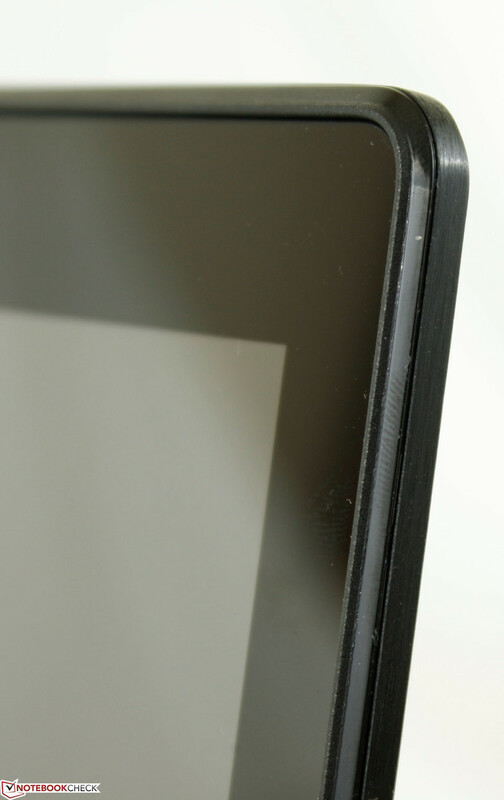 The lid doesn't twist so easily due to the small screen size and somewhat thick bezel, but pushing down on the center of the outer lid still causes a noticeable depression. Weight is a tad on the heavy side at just over 1.8 kg. This is a few hundred grams heavier than the competing Acer Aspire V3 (1.5 kg) and just slightly above the HP Pavilion 13 x360 (1.76 kg). For comparison's sake, the popular and more expensive Samsung ATIV Book 9 comes in at 1.4 kg. While the Asus is heavier, it does feel better built than a budget Acer Aspire model. At the same time, however, it can be difficult to hold in tablet mode for longer periods of time. Available ports include the basics with a notable exception. Users will be quick to notice that the system lacks a Gigabit Ethernet port, which forces wireless usage. Nonetheless, the 2x USB 3.0 ports should allow for a wide range of generic docking stations for additional connectivity features if needed. 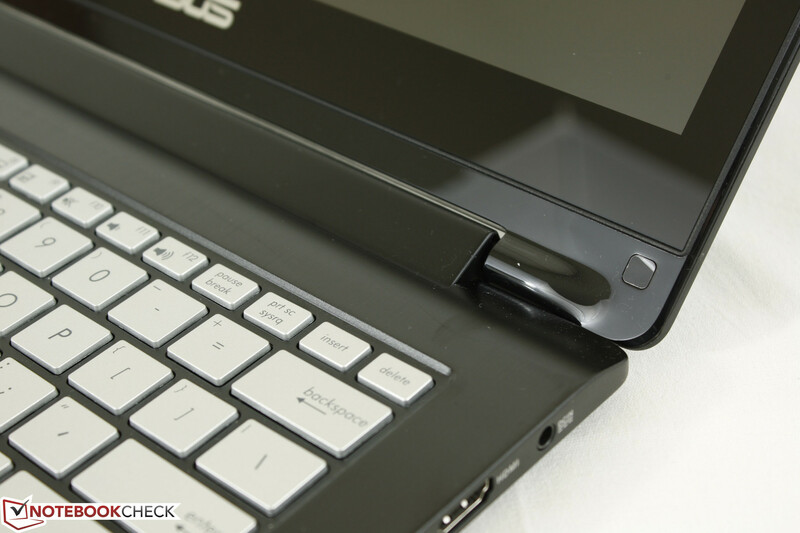 With no RJ-45 in sight, the Asus depends on WLAN for connectivity. The half-mini PCIe MediaTek MT7630E card is capable of wireless-n with integrated Bluetooth 4.0. We experienced no connection or dropout issues during our time with the test model. There are, however, user reports of connectivity problems with this particular MediaTek card when using older drivers. Updating the driver to at least v5.00.44.0 should prevent any related problems. There are no WWAN or GPS options outside of standard WLAN. Included accessories are non-existent outside of the standard warranty card and quick user guide. In this case, it would have been nice to have a USB-to-Ethernet adapter thrown in to alleviate the lack of a dedicated LAN port. The standard one-year warranty applies. Best Buy offers additional coverage plans for accidental damage and extensions. 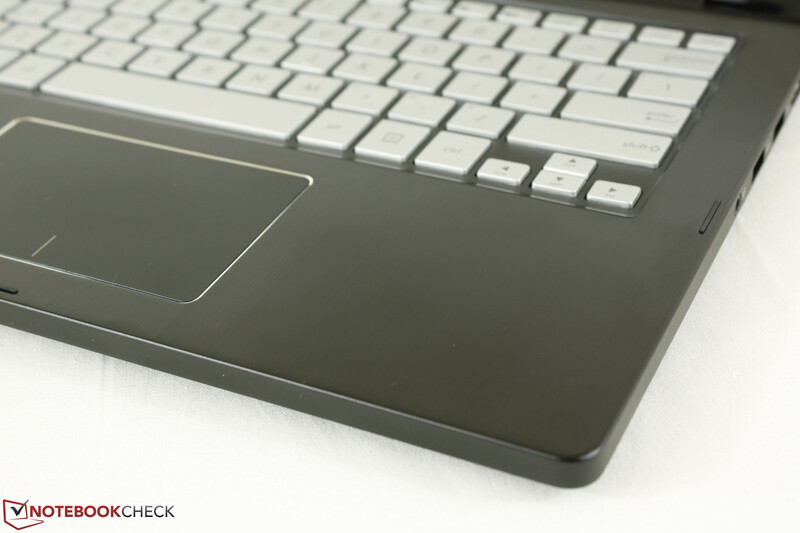 The Chiclet keyboard (27.5 x 10 cm) provides shallow travel with a firm-but-light response. 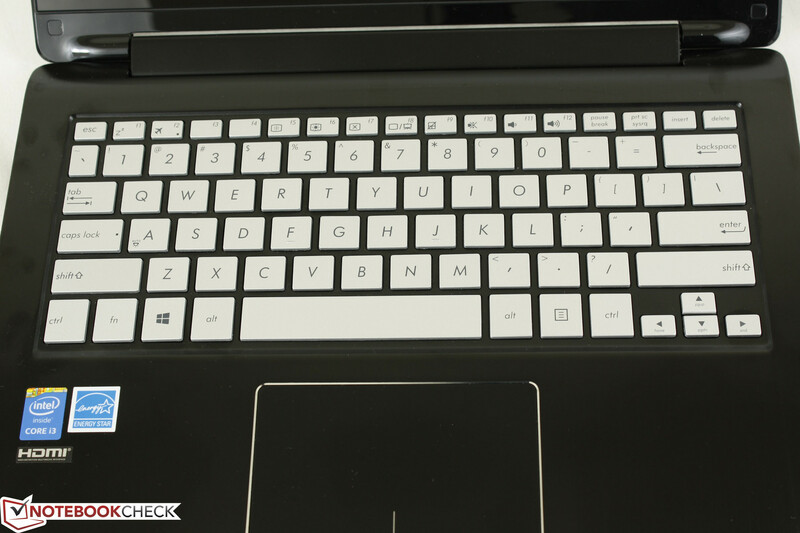 The keys are relatively quiet, but they lack the tactile feedback that a standard AccuType keyboard would on a Lenovo notebook. 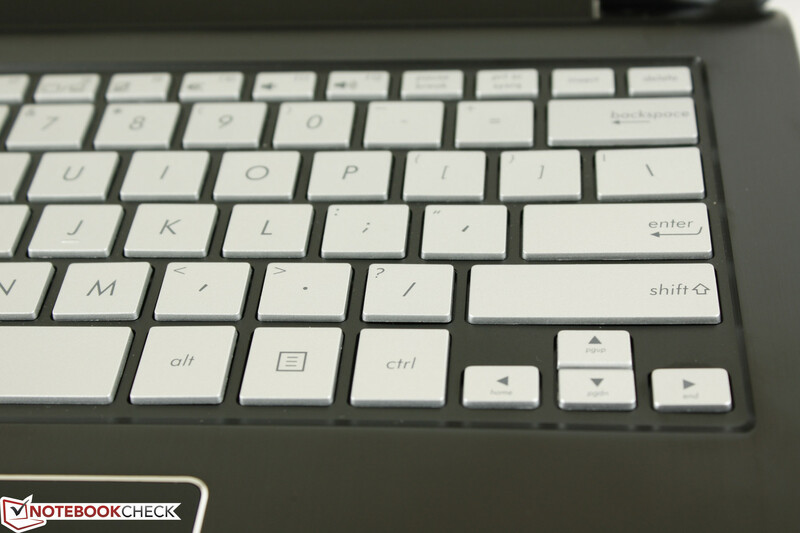 The small Arrow keys are even worse with lackluster feedback. 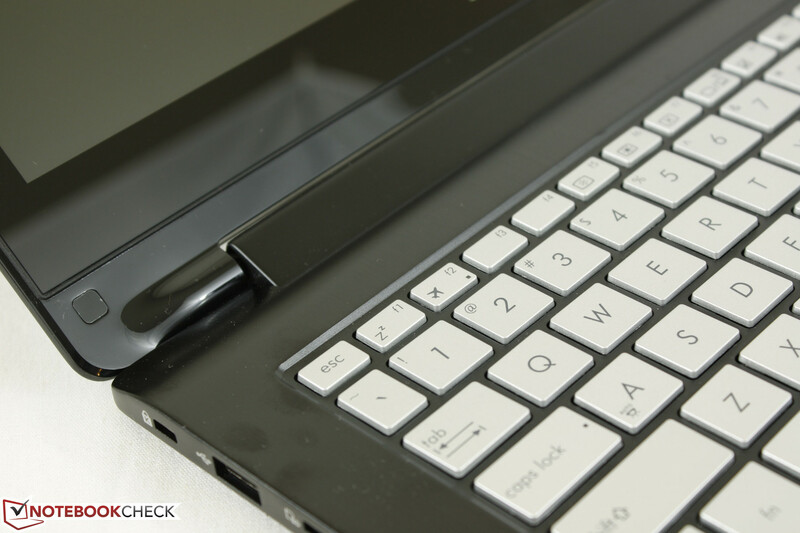 There are no additional dedicated multimedia keys outside of the volume rocker on the edge of the notebook. 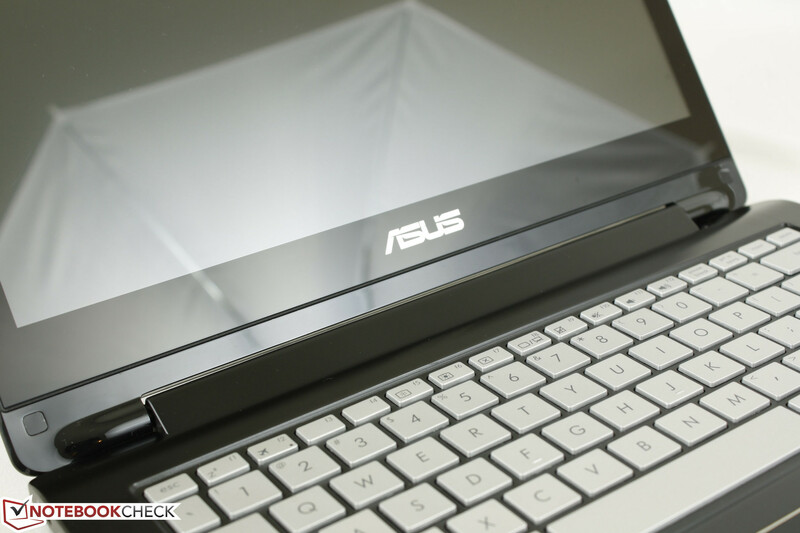 We do commend Asus for including a backlight for the keyboard on such an inexpensive model. Unlike on recent Yoga models, however, the keys will not automatically depress when in tablet mode. 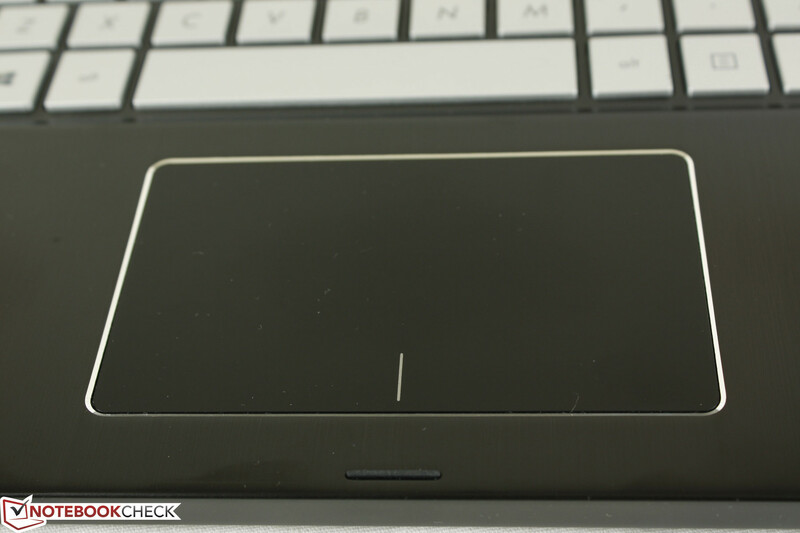 The touchpad is of adequate size (10.5 x 6 cm) with the same dimensions as on the Aspire V3-371. Unlike on the Acer, it avoids the cheap plastic look with a rigid surface and chrome perimeter similar to the touchpads on more expensive notebooks. Responsiveness and inputs are reliable with no issues around the edges and corners. The integrated keys are on the loud side when pressed, but this in turn means a firm response each time. 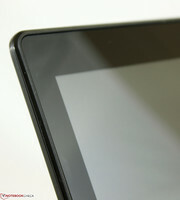 Multi-touch is supported if the user prefers scrolling and zooming with the touchpad instead of the touchscreen itself. 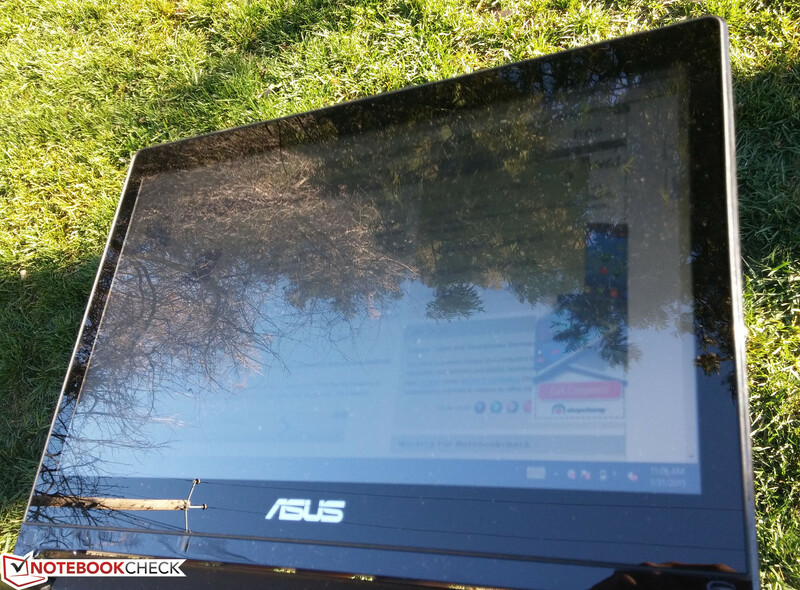 A native resolution of 1366 x 768 pixels is common on budget models and the Asus Q302 is no exception. 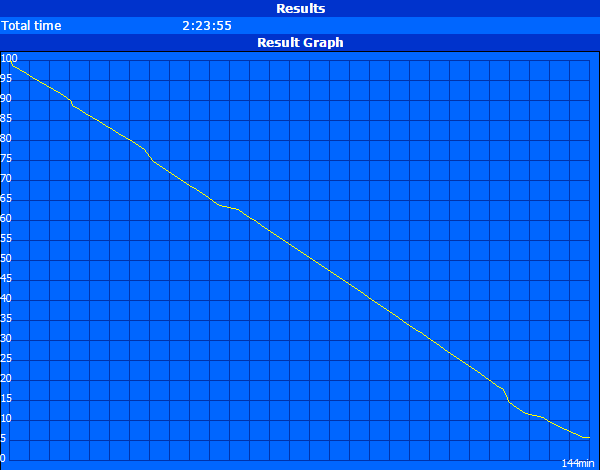 At this level, the screen-door effect becomes much more apparent as pixels are large and even blocky. It's an inexpensive panel for sure, but it's a compromise at this price range. 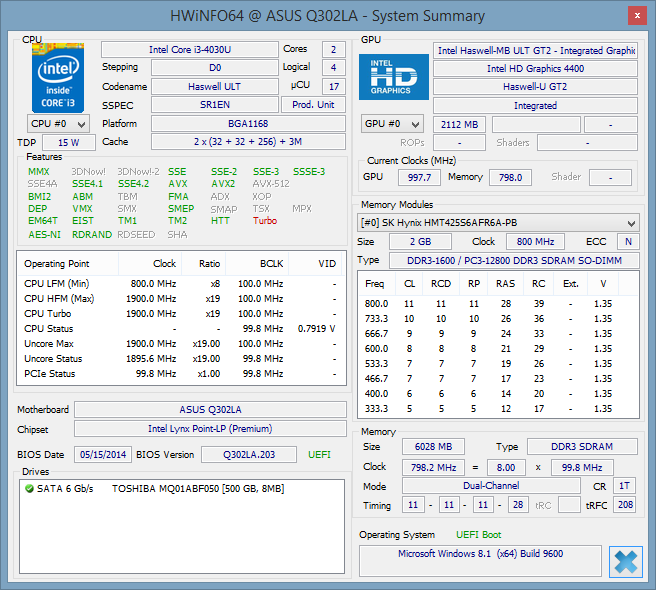 The BOE HB133WX1-402 panel on the Asus is not on any other notebook in our database, though similar TN panels from BOE can be found on other budget notebooks including the Transformer Book T200 and HP Stream 11 x360. 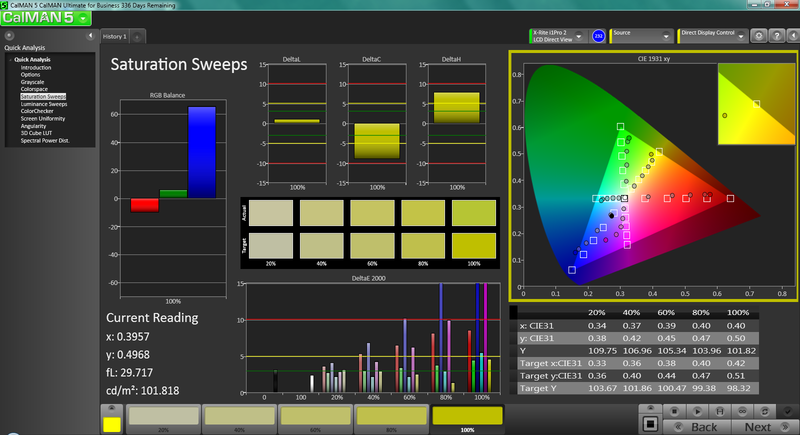 Brightness and contrast are just below average for a budget model at about 190 nits and 300:1, respectively. 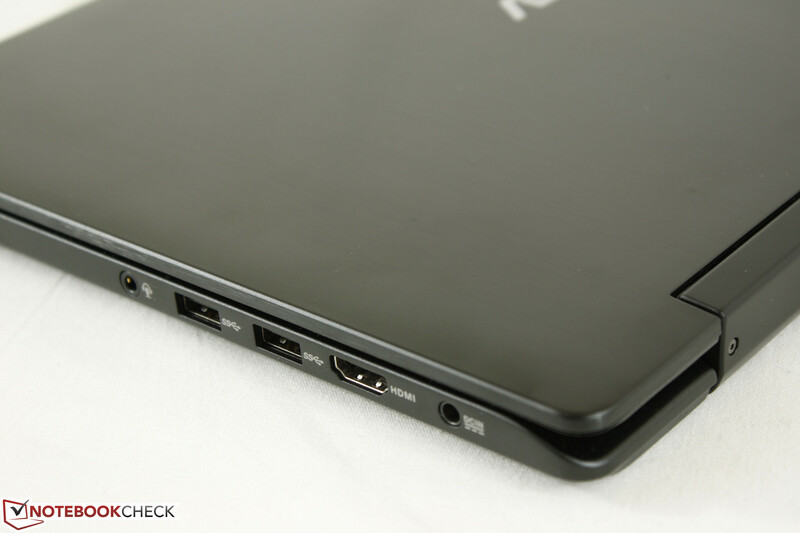 The Aspire V3 and even the Toshiba Chromebook have brighter panels and deeper blacks than the Asus. Thus, blacks tend to look gray and muddy during video playback. 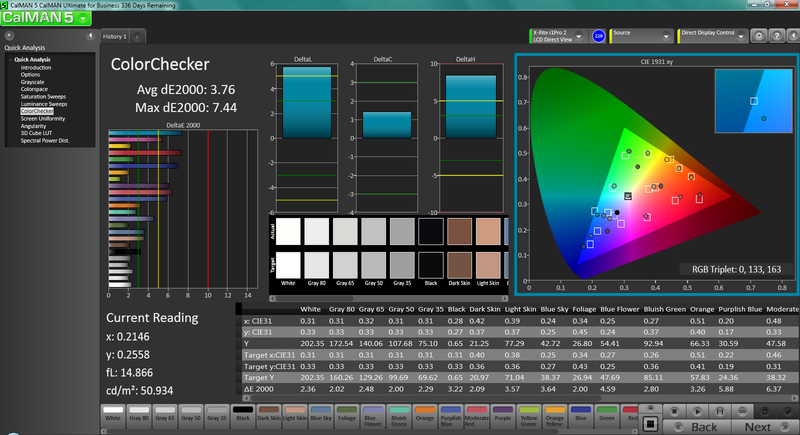 Color coverage is about 65 percent and 48 percent of the sRGB and AdobeRGB standards, respectively. 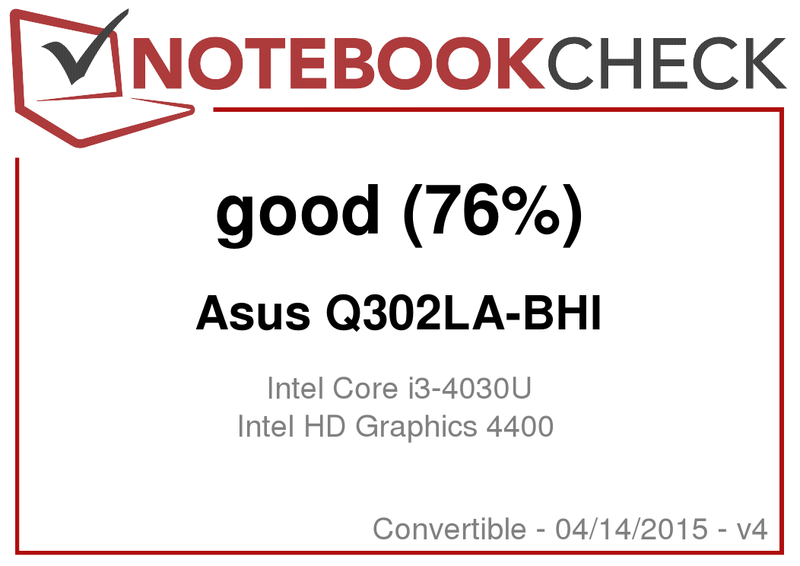 This is above average for an inexpensive notebook where panels with 60 percent and 40 percent coverages of the sRGB and AdobeRGB spectra are more common. For the target audience, however, this is not significant. 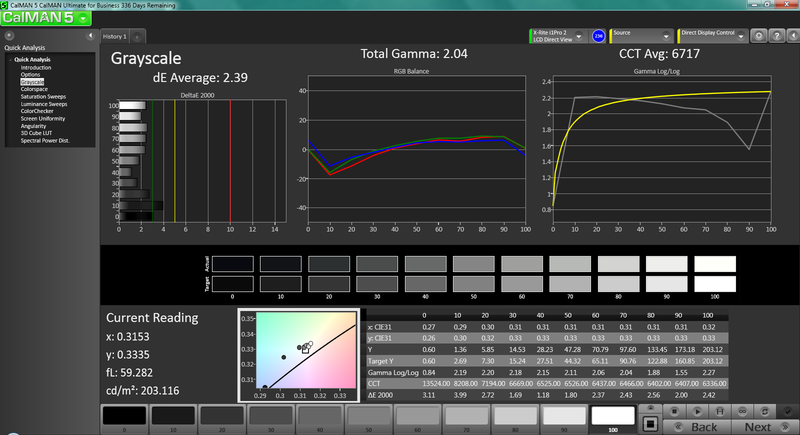 Further color analyses with an X-Rite spectrophotometer reveal inaccurate Blue and Magenta at deeper saturation levels. 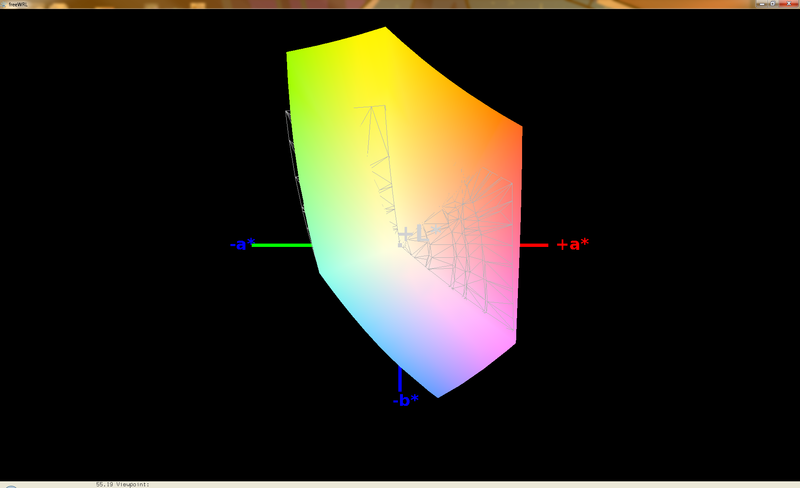 Colors tend to become more accurate the lower the saturation level for this particular panel. Color temperature is not overly cool unlike on most cheap notebooks, so the grayscale on this Asus is better than expected. The glossy screen and average backlight both make the Q302 difficult to use outdoors on a bright or overcast day. The 360 degree hinges do help in providing more viewing angle opportunities to reduce glare, but the TN panel puts a damper on getting consistent colors when changing angles. 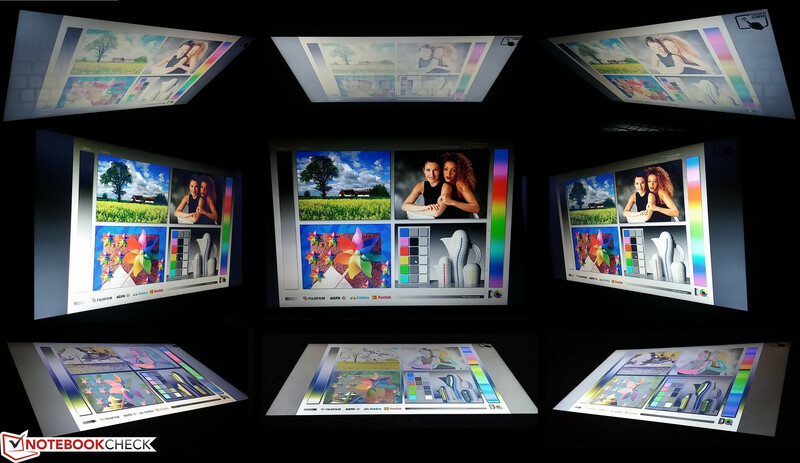 Luckily, the display backlight will not artificially drop in maximum brightness when disconnected from an AC source. Viewing angles are average due to the TN panel. The tablet and stand modes are subsequently more limited than they ought to be due to having a narrow viewing window. Sharing the display with others nearby is difficult regardless of what mode the notebook is in. 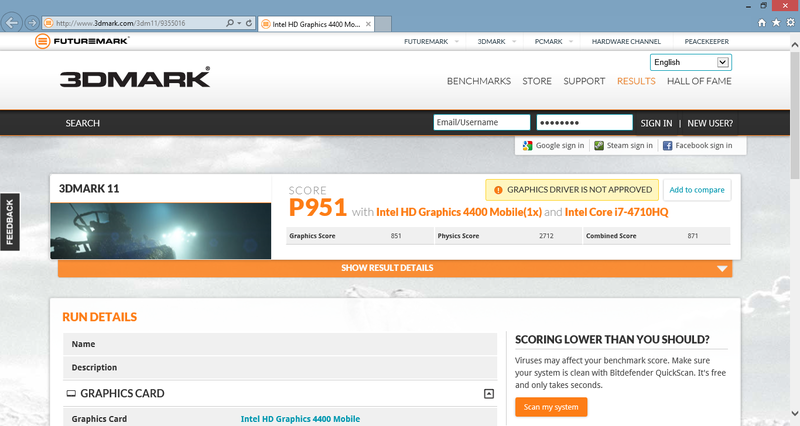 The Q302LA ships with an ULV Core i3-4030U with integrated Intel HD 4400 graphics. 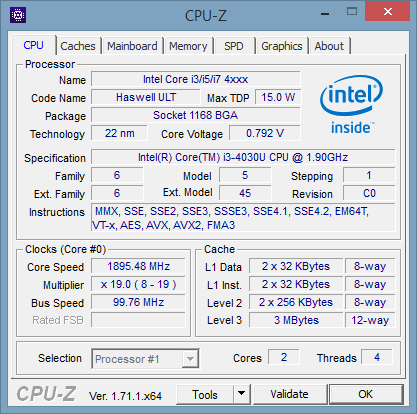 The dual-core Haswell does not support Turbo Boost as it is a part of the i3 family, so its base speed of 1.9 GHz is also its maximum. 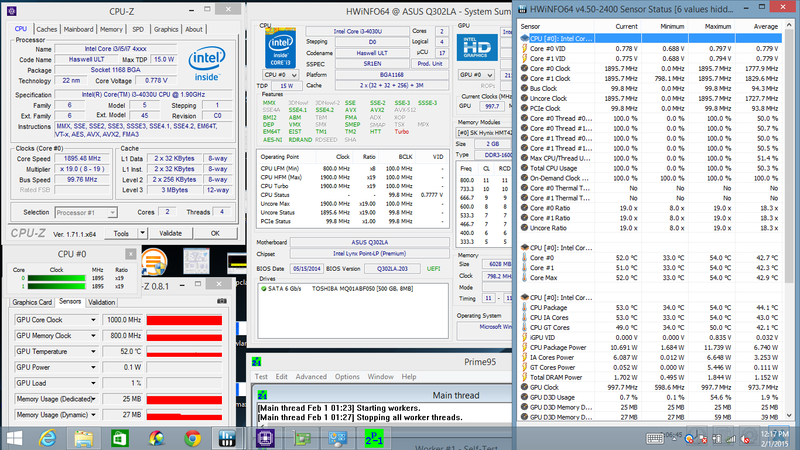 Another configuration is available with a Core i5-4210U for Turbo Boost up to 2.4 GHz for two active cores. 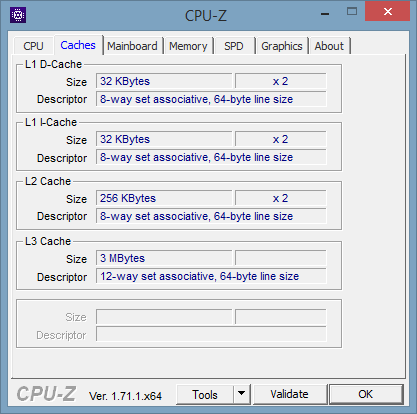 For our Core i3 configuration on hand, running on Power Saver mode will limit the CPU and GPU to 800 MHz and 600 MHz, respectively. RAM is provided by two SODIMM modules for a total of 6 GB. The alternate Core i5 configuration will ship with 8 GB total. 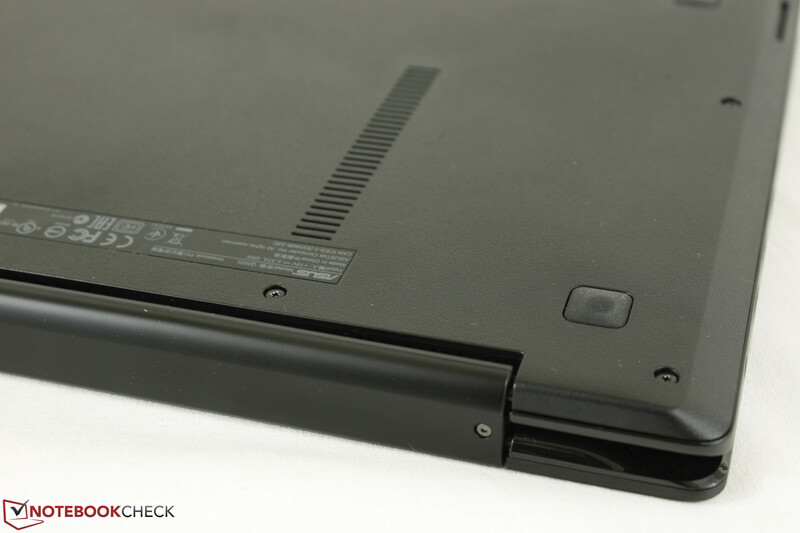 The RAM slots, HDD, and other core components are easily accessible by removing the maintenance panel underneath. 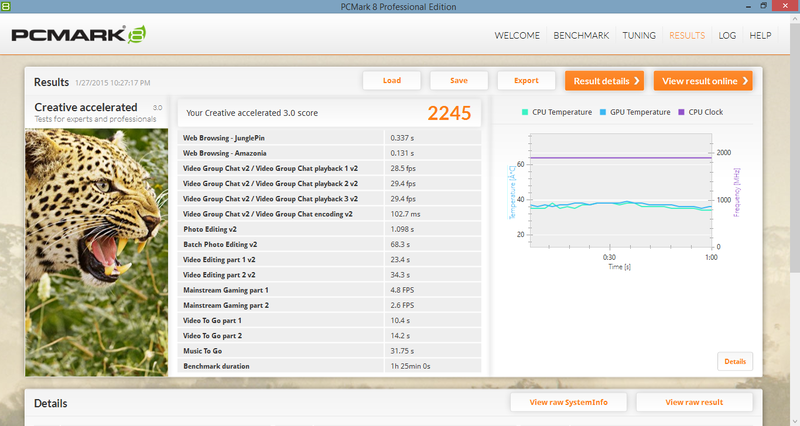 Synthetic CPU benchmarks place our Asus alongside other notebooks sporting the same processor such as the Pavilion 13 and Aspire V3. Thus, core clocks are not artificially reduced for any thermal reasons. 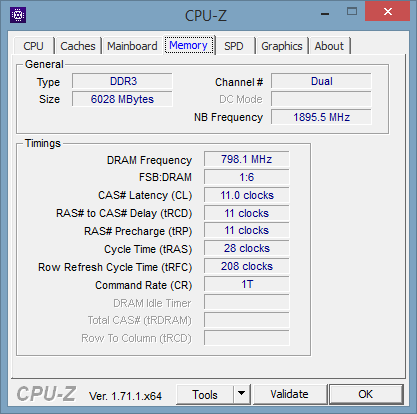 Overall performance is similar to a mid-tier AMD Richland processor, such as the A8-5550M while requiring less power (15 W vs. 35 W). 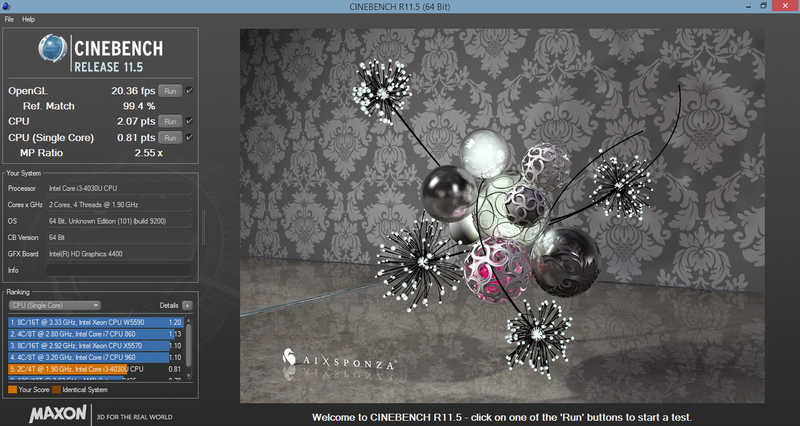 Compared to the previous Sandy Bridge generation, the i3-4030U is just a hair slower than the popular i3-3110M by 5 to 10 percent according to CineBench. 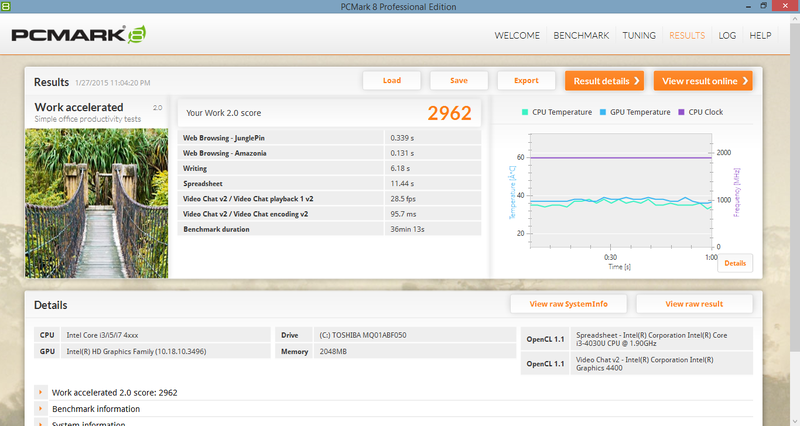 PCMark benchmarks return average scores that are expected from Core i3 notebooks with mechanical 5400 RPM drives. 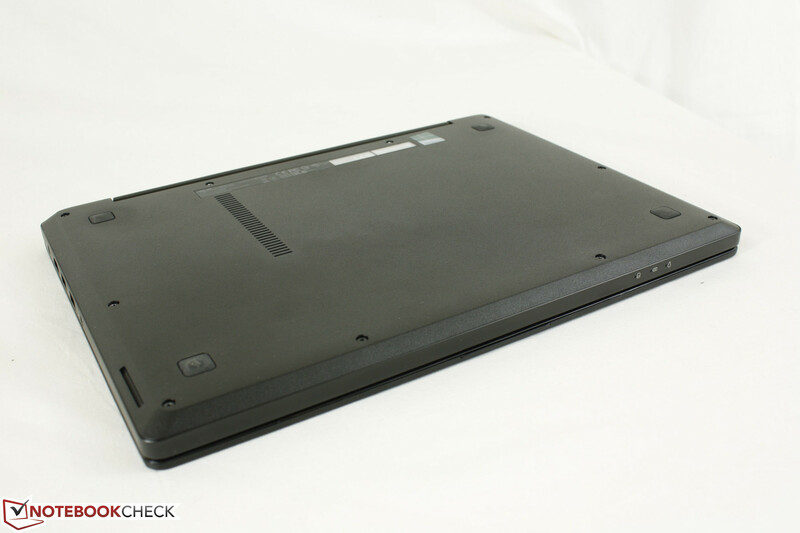 Other models with a similar i3 or i5 configuration return very similar scores, such as the VivoBook S301 and Toshiba Satellite Radius P50W. 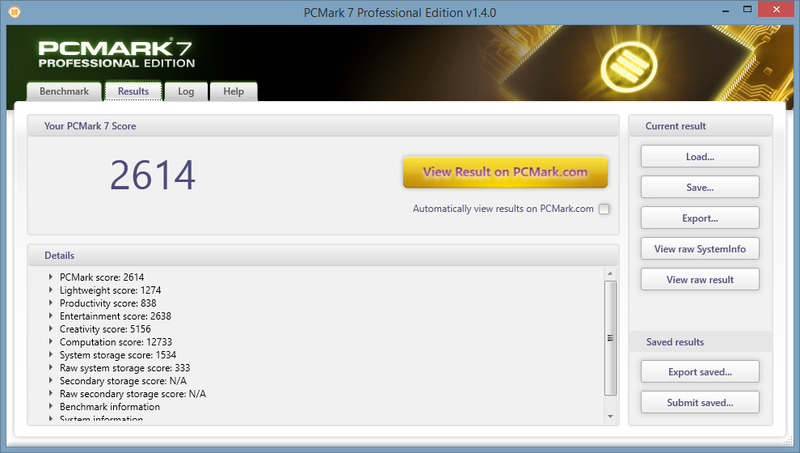 It's worth noting that the final PCMark 7 score of 2614 points is essentially identical to the Pavilion 15 equipped with the AMD A10-5745M APU and Radeon R7 M260 GPU. 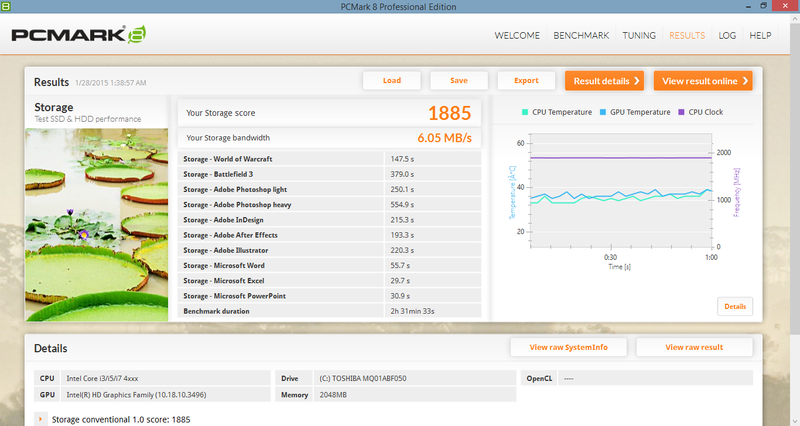 Subjectively, system performance is of course not as fast as systems with dedicated SSDs. What we look for instead is consistency in navigation and when launching applications. 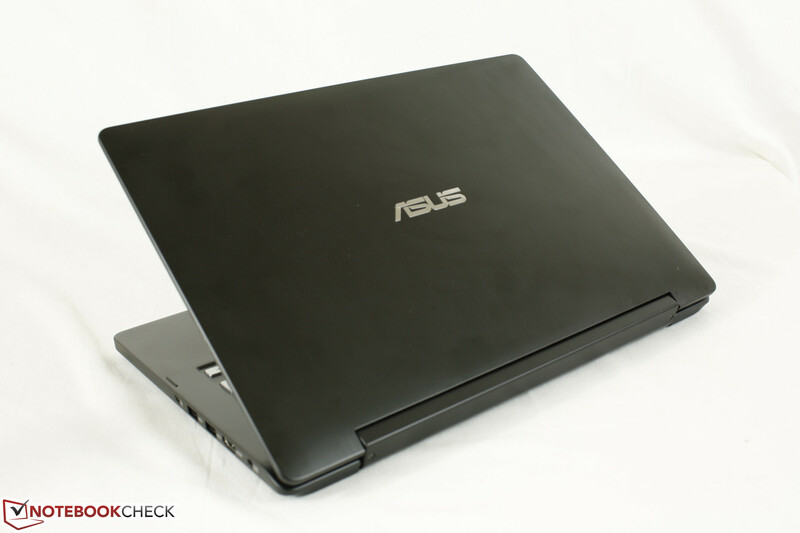 In this regard, the Asus is lag-free with no skipped frames or unusually long bouts of loading. The Asus ships with a standard 500 GB 5400 RPM Toshiba drive. 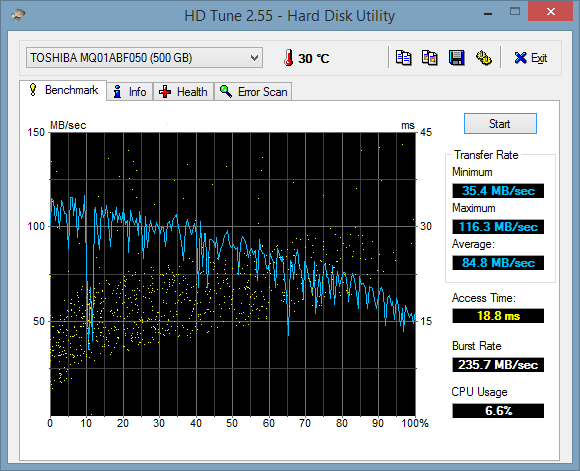 Average transfer rate according to HD Tune is good considering the low RPM at almost 85 MB/s. 7200 RPM drives frequently near 100 MB/s or higher, while slower 5400 RPM drives typically come in around 75 MB/s. 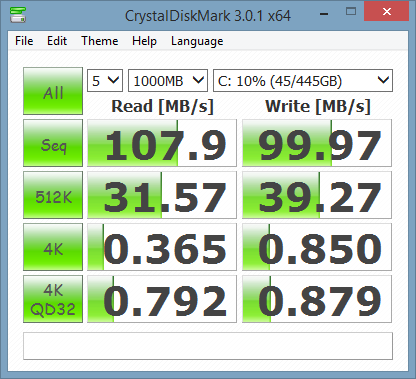 In comparison, SATA III SSDs that are now common amongst mainstream Ultrabooks have transfers rates at hundreds of megabytes per second with almost non-existent access times. 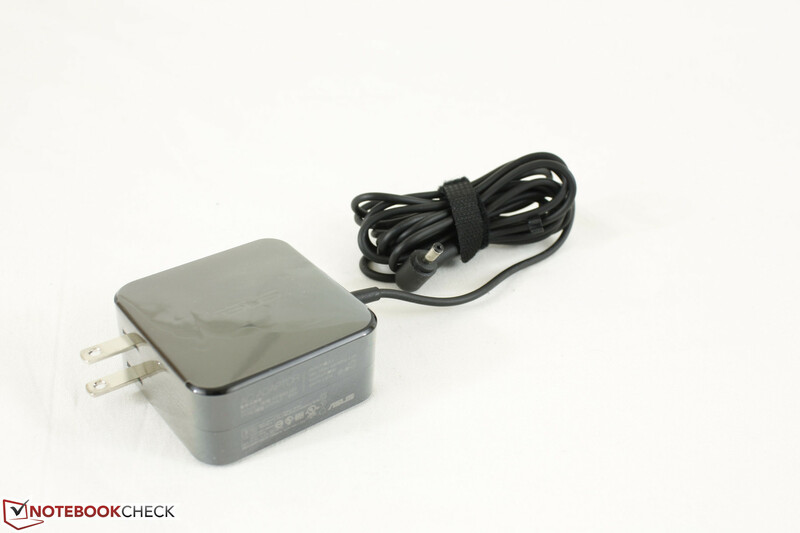 Replacing the Toshiba HDD with a standard 2.5-inch SSD is fortunately easy on the Q302. 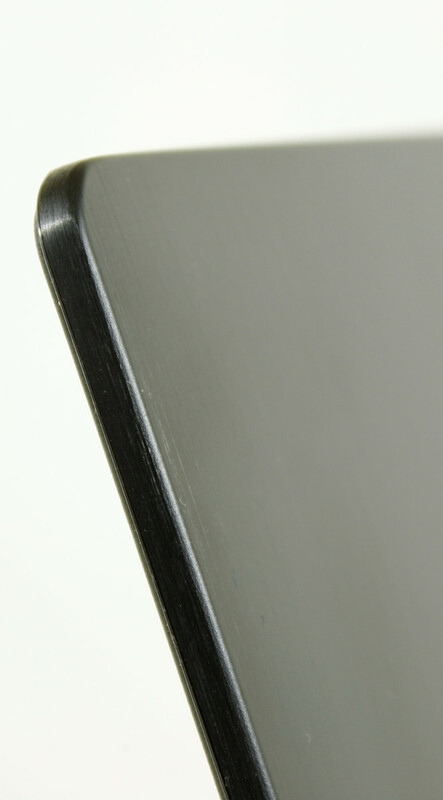 If replacing the existing HDD with another HDD, it may be best to stick with a thickness of 7 mm for compatibility. For our growing performance list of HDDs and SSDs, see our dedicated page here. 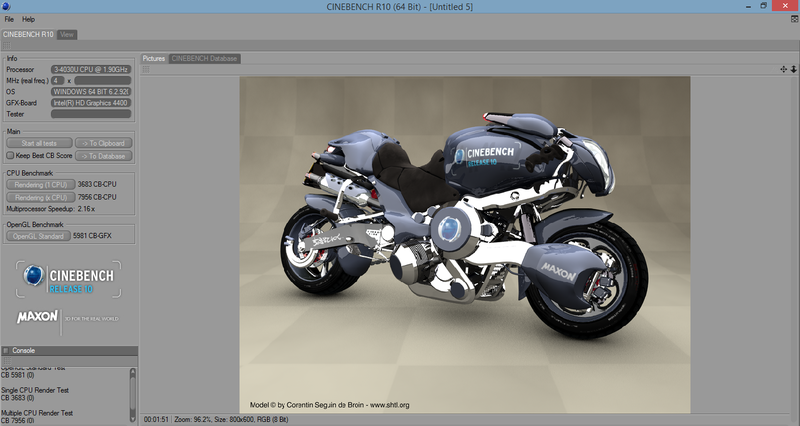 The Intel HD 4400 is designed for ULV processors and supports DirectX 11.1, OpenCL 1.2, and OpenGL 4.0. 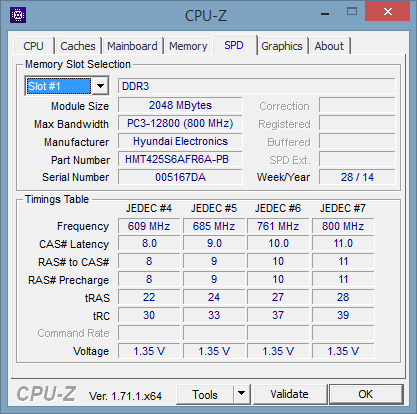 Its clock speed is highly variable depending on the CPU it is paired with from as low as 200 MHz up to 1100 MHz if boost is available. 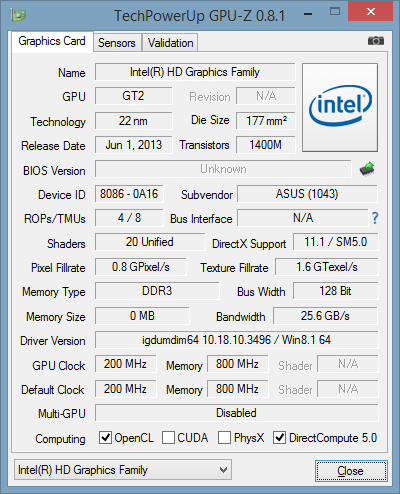 On our Asus model, the GPU tends to stick in the 600 to 1000 MHz range. Gaming power is limited and is most similar to dedicated low-end Nvidia GPUs that are now more than a few years old. 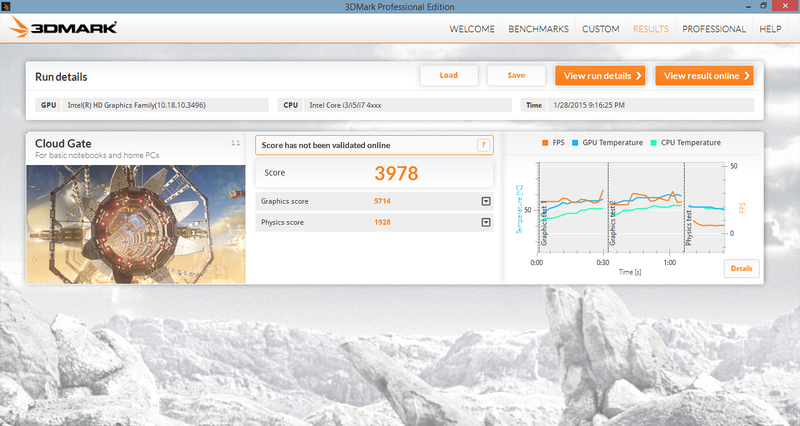 For example, the GeForce GT 620M and GT 540M score similarly to the HD 4400 in 3DMark 11 and 3DMark Cloud Gate, respectively. 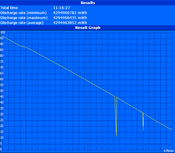 Users can expect to play most games at reasonable frame rates at very low graphics settings, but demanding 3D titles like Thief and Middle-earth are unplayable even on bare minimum settings. We stress the Q302 under synthetic conditions to test for any throttling or stability issues. 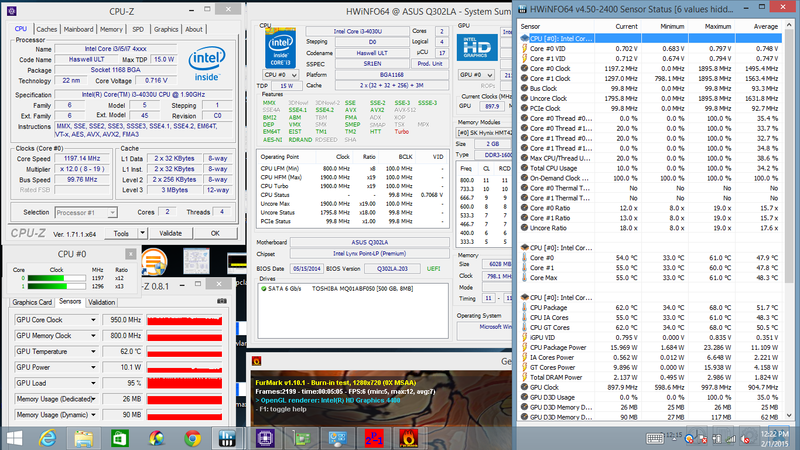 With Prime95 active, the CPU is able to maintain its full 1.9 GHz clock while core temperatures peak at 54 C. Similarly with FurMark active, the integrated GPU runs reliably in the 800 to 950 MHz range while core temperature becomes a bit warmer than the CPU at 62 C. Full stress with both Prime95 and FurMark active simultaneously will throttle the CPU to 1100 MHz. 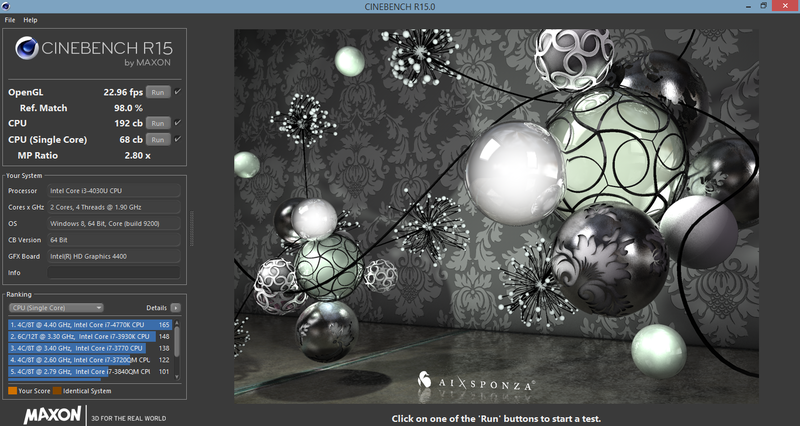 The GPU experiences less of an impact and almost never falls below 800 MHz. 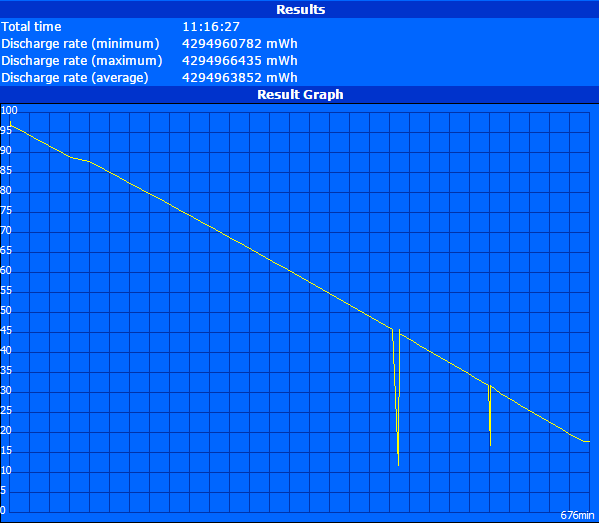 Running on batteries will have a very slight impact on overall performance. 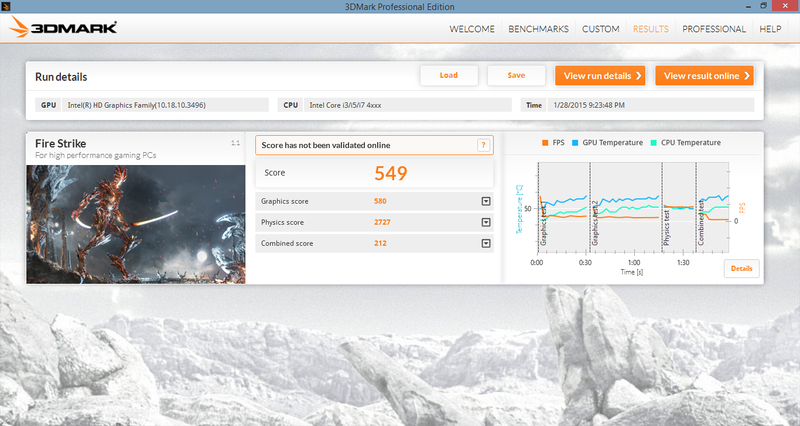 A 3DMark 11 run on batteries returns graphics and physics scores of 797 and 2644 points, respectively, versus 851 and 2712 points on AC adapter power. 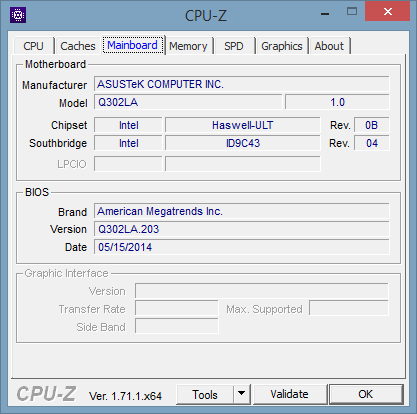 Users will still have access to nearly all of the computing power of the Asus should AC power be unavailable. The system fan is near-silent and is perfect for video playback or in quiet environments like classrooms or libraries. Standard browsing and Flash games do not increase fan noise, so users can enjoy light multitasking without pulsating fans that occasionally happen on much more powerful systems like gaming notebooks. 3D gaming will bump fan noise all the way up to the 43 dB(A) range, which is as loud as the similarly equipped HP Pavilion 13 x360. 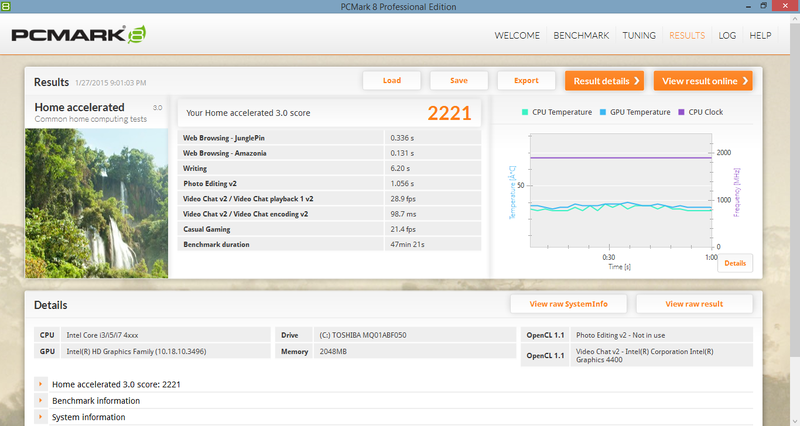 This is also similar to most Ultrabooks when under high CPU or GPU stress. Surface temperatures when idling are flat on both sides of the notebook. The bottom is slightly warmer by a few degrees near the rear of the unit. When under maximum load, the highest recorded temperature was just a little over 36 C. This is very good as Ultrabooks tend to reach 40 C or higher under the same conditions. 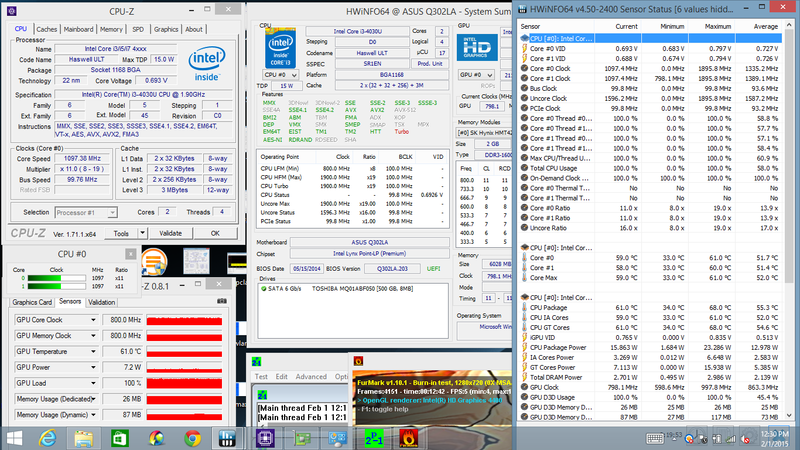 The drawback is the slower Core i3 CPU in our test model compared to more common and powerful Core i5 solutions. 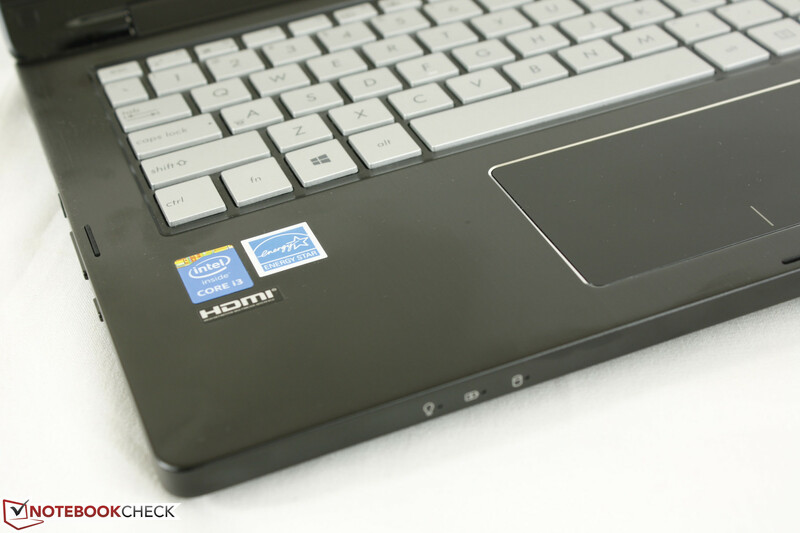 The Acer Aspire V3-371, for example, has a more powerful Core i5-5200U with surface temperatures as high as 40 C under stressful conditions. (+) The maximum temperature on the upper side is 31.2 °C / 88 F, compared to the average of 35.4 °C / 96 F, ranging from 21.8 to 55.7 °C for the class Convertible. (+) The average temperature of the palmrest area of similar devices was 29 °C / 84.2 F (+3.2 °C / 5.8 F). 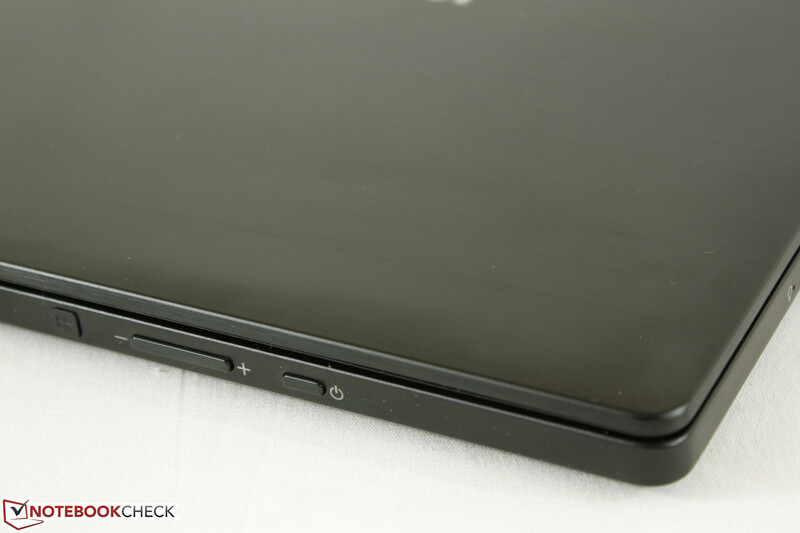 The stereo speakers on the front of the notebook are loud at maximum volume with good quality for the size. 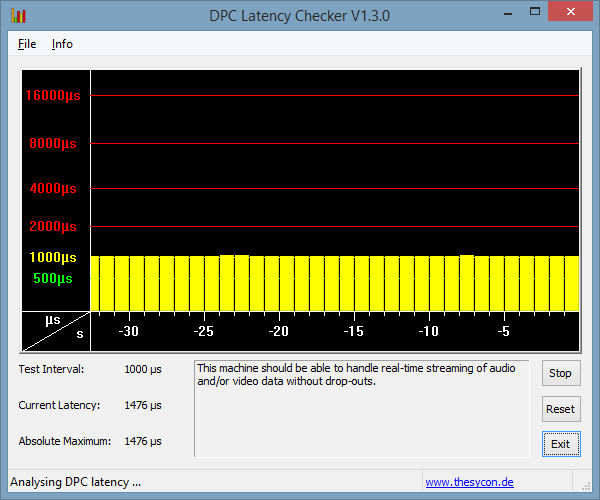 There are no heavy imbalances or static during playback, though bass is of course lacking. Otherwise, the speakers are acceptable for the occasional music and video. Best results are still with external speakers via the 3.5 mm audio port. The integrated 3-cell battery has a capacity of 4430 mAh and is non-removable. 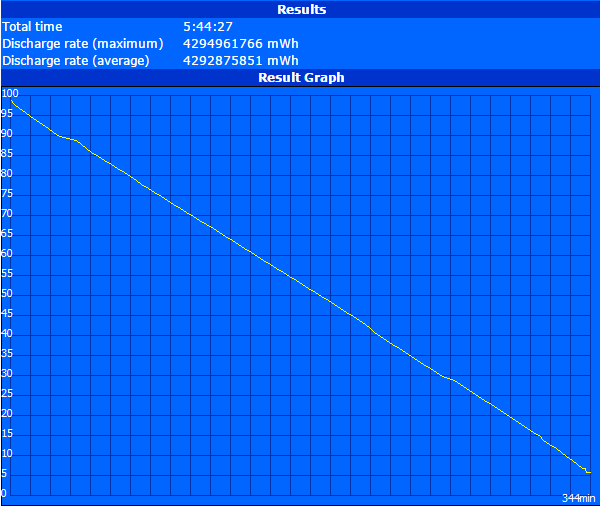 Runtimes are a bit above average at just over 5.5 hours of constant WLAN use at 150 nits brightness. This is longer by at least an hour compared to the older first generation Lenovo Yoga 13, though it still falls behind the Aspire V3-371. The latest generation of Ultrabooks, such as the new Dell XPS 13, can last for over two hours longer during WLAN use under similar conditions. 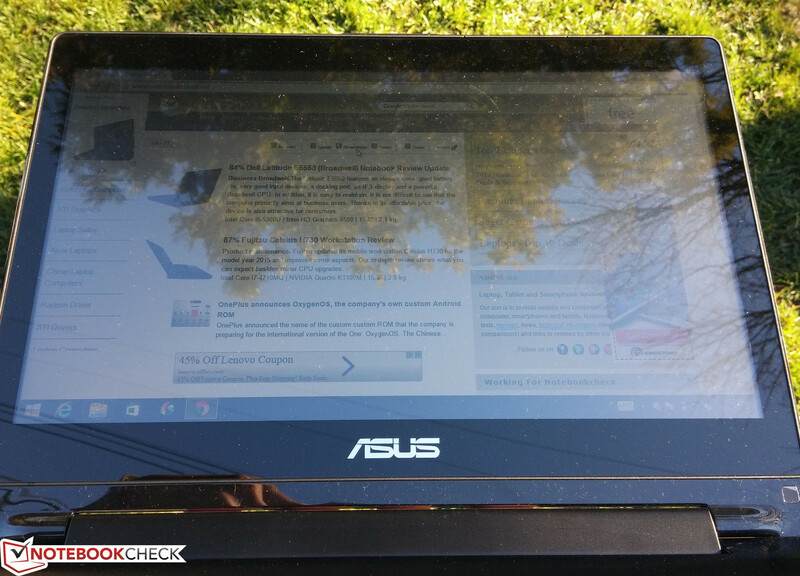 The Asus Q302 is great at its surface with an appealing brushed aluminum lid and easily upgradeable HDD and RAM. Since it doubles as a tablet, the model is also versatile around the household with respectable battery life. The notebook begins to fall apart under outdoor conditions. Even though the screen size is fit for traveling and classwork, the TN panel limits usefulness in tablet mode with greatly reduced viewing angles. The low brightness further exacerbates the poor visibility of the glossy screen. The Asus is fine as a secondary home notebook, but competing models tend to be lighter with faster hardware or offer higher display resolutions for better primary use. 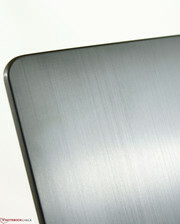 Brushed aluminum chassis looks great especially for the price. 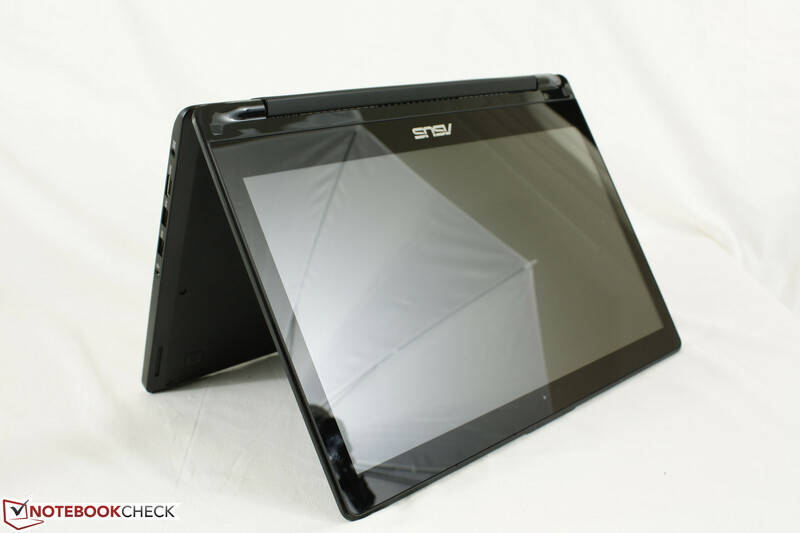 Brighter display and an IPS panel for improved usability and viewing angles.